Nibiru has a 3,600 year elliptical orbit. 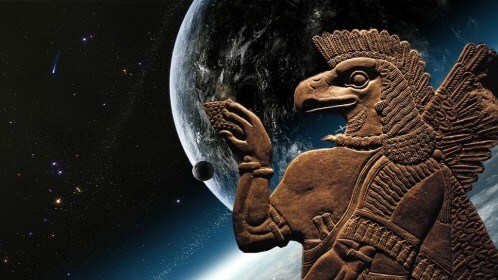 The Anunnaki came from Nibiru to mine Gold on Earth. Nibiru’s minerals and resources were depleting, specifically Gold. All kinds of dreadful gravitational phenomena are connected with Nibiru and some even argue that Planet X or Nibiru poses a threat to Earth and that one day it will collide with our planet. Science explains that it might exist, but they just haven seen it yet. Mythologically speaking, Nibiru is real. There are four primary gods: Anu, Enlil, and Enki. Enlil is considered the god of breath, the wind, loft and breadth (height and distance). Enlil is associated with the ancient city of Nippur, sometimes referred to as the cult city of Enlil. According to the ancient Sumerians, ‘Eridu’ –modern day Abu Shahrein, Iraq– was believed to have been the first city ever created, and was the home city of the great God Enki. The city is thought to have been founded circa 5400 BC.